I really tried to keep my expectations low for Indiana Jones and the Kingdom of the Crystal Skull. I had heard mixed things about it, but being a fan of the first three films and even of the television series The Young Indiana Jones Chronicles, I could not give it a pass. The plot: Indiana Jones (Harrison Ford) now finds himself in the Cold War era - a bit older and greyer but still combining his job as a teacher with his activities as a daredevil archaeologist. To help out a friend, he travels to Peru in search of a Crystal Skull with mysterious origins. Adventure ensues and things get personal. I could not really get into it. 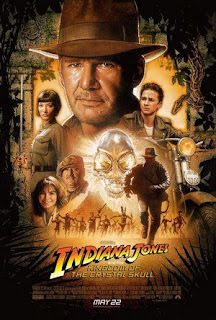 The movie comes across as both homage and epilogue to the original trilogy rather than an equal sequel, though it does give Indy's life an extra dimension it had been missing and a sense of closure. The main story seems a retread in the way it was structured: a lot of scenes recycled and remixed but hitting the same beats. The climax is also predictable in following the Indiana Jones mold, to the point of being boring. The Crystal Skull itself - so central to the story - just looks goofy any time it is on the screen and makes it hard to take all the reverence towards it serious. The previous movies already didn't seem too concerned with believability if it impaired a cool scene, but this entry gives up on the concept entirely. It takes away from the tension, as the heroes can survive pretty much anything and are in no real danger. Even on a simple emotional level the plot doesn't track: Marion and Indy set aside their differences in no time and reignite the spark, even though neither one cared enough to stay in touch over the years. And it seems unlikely that Marion never let Indy in on a certain little secret she had been carrying around. But then the focus is not on the characters, it is on the silly action sequences and the odd-looking skull. After seeing this movie I don't really know if I would like to see Indiana Jones return. It is a shame; the previous movies thrilled me but with this one, as the end credits started to roll, I looked over at my friends and we shrugged at each other. Just another popcorn movie. Indiana Jones and the Kingdom of the Crystal Skull, 2008. 124 min. Director: Steven Spielberg. Starring: Harrison Ford, Cate Blanchett, Shia LaBeouf.